Be one of the first to run Stronger by Science’s Average to Savage 2.0 in the Gravitus iOS app. You’ll get immediate access to the program, including tips from Greg Nuckols, for just $19.99. Average to Savage 2.0 is an incredibly flexible program that’s designed to adapt to your schedule, your preferences, and your rate of progress to maximize your strength gains. It’s a full 21 week macrocycle that will bring huge strength gains for intermediate and advanced lifters. It’s split into three blocks that are each seven weeks long (six hard weeks and one deload week). The program starts with lighter, higher volume work in the 60-70% 1RM range, and progressively gets heavier, eventually progresses to a 1RM test. Volume per session is determined using reps in reserve. This autoregulation ensures that you can push yourself on days you feel good, and you won’t grind yourself into dust if you start accumulating fatigue. Most of the volume in this program comes from primary lifts (squat, bench press, deadlift, and overhead press) and close variations. You can add accessories if you want, but it’s designed to revolve around heavy, basic compound lifts, while still allowing for enough variation to hone motor skills and likely reduce the risk of overuse injuries. Loads are progressed based on your performance week-to-week. If you’re making progress quickly, the training loads will naturally increase quickly so that your progression isn’t artificially limited. If you’re a more experienced lifter who makes slower gains, this program won’t force you into a pre-set progression scheme that may be overly optimistic. In short, the program fits the training loads to your rate of gains, rather than shoehorning you into a fixed progression. 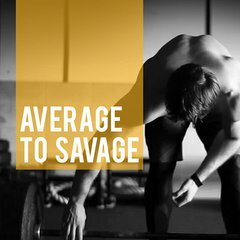 Follow the brand new Average to Savage 2.0 program, step by step, via the Gravitus iOS app. Lead you through strength testing the main lifts, personalizing the program for you. Allow you to customize the exercise variants used throughout the program. Provide you with three fully-defined workouts per week including personalized weight, set and rep goals for each day. Access tips from Greg, making sure your form is 100% on point. Give you the tools to track your progress, including charts and graphs of your entire training history, on-program or off. Connect you with the Gravitus community of lifters, with leaderboards, video sharing and more. The best advice, backed by science, for getting stronger.